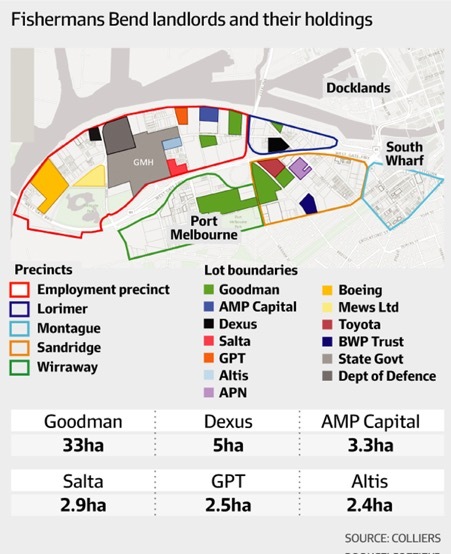 Goodman Group, Dexus, GPT Group, and others are pondering the value of their landholdings at Fishermans Bend after the Victorian state government failed to commit to transport connections to the former industrial precinct on Melbourne’s edge, says the AFR. 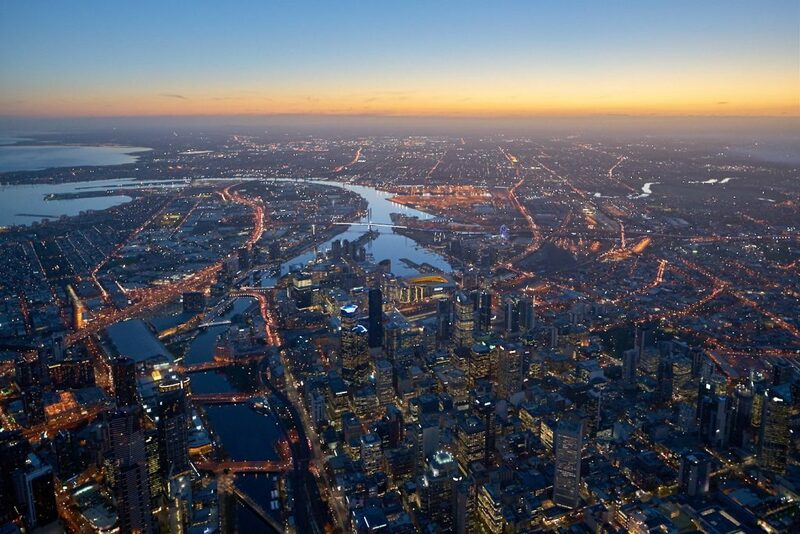 After years of uncertainty and numerous planning changes, Victoria’s Planning Minister Richard Wynne finally revealed his government’s strategic plan for the new residential and employment hub. While the planning framework provides owners and developers some certainty around the 485-hectare precinct, the lack of a state commitment to build the tram and rail services slated for the area is causing developers concern. The government aims to accommodate 80,000 residents and 60,000 workers in five precincts at Fishermans Bend by 2050. The ability to move large volumes of workers and residents in and out of the precinct is therefore crucial. “A firm commitment to the timing and funding of infrastructure will be the real catalyst for transaction activity in this precinct,” real estate group Colliers industrial director Alysia Reilly said. The current government plans include a proposed underground rail line, new tram routes, and high frequency bus services, with the aim that only one in five trips will be made by private car, says ABC News. However, the government is yet to clarify how and when the transport links will be built. The new framework affirms previously identified routes and land for tram and rail lines, but says funding them is up to future budgetary processes. Earlier this year consultancy AECOM put the likely cost of extending the existing tram lines down Collins Street into Fishermans Bend at $1 billion and said this was a priority for drawing investment and for making the precinct work. Arup principal and former Labor planning minister Justin Madden said the urban regeneration zone needed $10 billion of transport infrastructure to be viable. In 2012 then planning minister Matthew Guy rezoned four of the precincts in the site overnight as capital city zone, effectively removing height limits and making little provision for the funding of infrastructure in the area. Mr Wynne overturned that regime in 2015 by imposing interim controls that were replaced with permanent ones last week. The uncertainty created by repeated changing of the rules in Fishermans Bend has dampened property and real estate transactions in the area. “Each time the planning controls change, there is a flow-on effect to the development capacity of a site and fundamentally, its feasibility,” Ms Reilly said. Just one development site sold across the combined precincts this year, compared with six last year, Colliers figures show. GPT’s head of office and logistics, Matthew Faddy, welcomed the new planning announcement, but added: “Until there is a firm commitment to the timing of the infrastructure, we don’t foresee there being a significant amount of transaction activity in the precinct. We anticipate that just the odd site will trade here and there, as has been the case recently, until there is a commitment to timing and funding of infrastructure”. Goodman is the largest landowner in the Fishermans Bend precinct, owning 33 hectares, most of it in precincts slated for residential development. Dexus accounts for five hectares across the employment and residential precincts and GPT has 2.5 hectares in the employment hub. Other landlords include BWP Trust and APN Property. Land rates vary between the four different sub-precincts, with the two closest to the CBD (Montague and Lorimer) fetching an average of $6,000 per square metre over the past five years, compared to the average $1,900 per square metre in the Sandridge and Wirraway precincts.